One of the main USPs that makes Proviz stand out above our competitors is the constant and dedicated innovation, research and development to push the boundaries to make our products the very best in our niche of enhanced visibility. We have a team that is always looking for the best fabrics and technology to provide the cutting edge in cycling, running and outdoor products. We have always believed in a philosophy that once we have a viable product idea there is always a way to get the product created. When we started with our first product, the Saturn Cycling Helmet, we had no previous products to show the factory to demonstrate the particular fluorescent yellow colour that we were after, which made the project particularly challenging. However we knew we needed to get this product created to get the brand off the ground. It took rounds of samples to get the colour right and then getting a light integrated into the front was another issue all together, however the tenacity paid off as we were the first helmet manufacturer to bring this type of helmet to market. This was recognised soon after by the one of the world’s largest and most innovative companies taking these products for their workforce as well as many retailers and distributors buying them to sell globally. 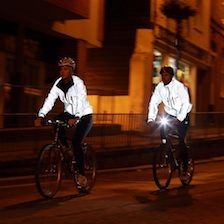 We had an idea to bring out a removable lighting device that could work across our Nightrider Collection which needed to be very bright, versatile, slick and like nothing on the market. We found the wonderful electroluminescent lighting and after rounds of designs, late nights, debate….we created the award winning Triviz Lighting Device. To put it simply, at night, blue (along with green) is the colour the human eye is most sensitive to. This means it is the most eye-catching and prominent colour on the roads at night making the user of our blue Triviz coloured lighting systems stand out on the roads at night and their position more easily identifiable. The light could be made in any colour. However, the electric blue colour used produces the greatest apparent light output for the least electrical power input. We have also made a Triviz in red as some countries require this. The Triviz Lighting Device won a Red Dot Design Award in 2013 with the judges being impressed with the innovation, versatility and quality of the product. 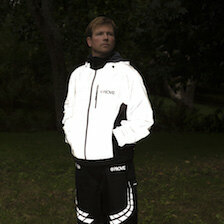 When we launched the REFLECT360 Collection, trying to get a fabric that was a modest grey during the day, 100% waterproof and 100% reflective at night took a lot of time to get right and it put Proviz firmly on the global map. However we didn't want to rest on our laurels so we continued searching for an even more superior fabric. 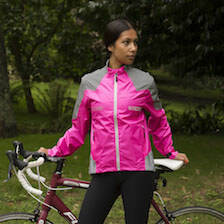 The year after we sourced the REFLECT360 Plus fabric which went on to become an even better seller combined with the SWITCH Reversible Range. 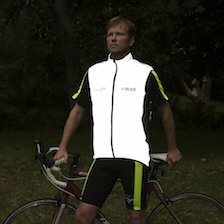 To continue the innovation we asked the question whether a coloured jacket could be reflective. 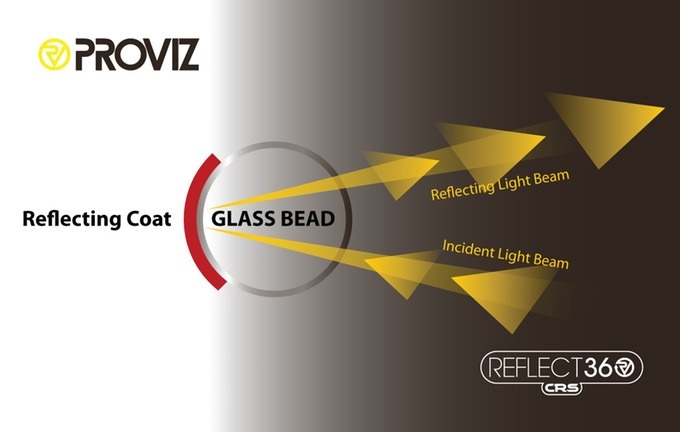 It sounded a bit out of leftfield but we managed to sourced the REFLECT360 CRS colour reflective fabric, which almost has to be seen to be believed! Creating a performance fabric to be used by performance cyclists and runners that needed to be everything in terms of cut, fabric, breathability and functionality but still having great reflectivity was a challenge that pushed the team to one of their greatest achievements. We partnered with the right factory and created the stunning Pixelite fabric which is now used by elite athletes globally. We will continue evolving, developing, researching and innovating to constantly stay one step ahead of the game. Part of the DNA of Proviz is we love bringing innovative, new products to the market and seeing them have such an impact on people.